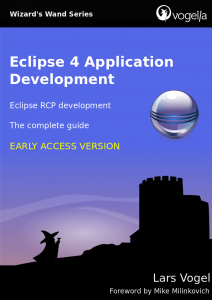 Finally, I can announce that the first version of the Eclipse 4 RCP Book is available. Not everything is completely polished, but it should be already a good starting point to develop Eclipse RCP applications with the Eclipse 4 framework. Once Eclipse 4 is officially released I will publish an update of the Kindle version which the buyers will get for free. Also after the official release I plan to publish a paper version. This book gives a detailed introduction into the Eclipse 4 platform and covers all relevant aspects of Eclipse 4 development. It assumes no previous experience with Eclipse plug-in or Eclipse RCP development. This description usually covers in a theoretical part the concepts of a specific topic and afterwards provides exercises and tutorials to practise these concepts. After a short introduction into the Eclipse platform, you will create your first Eclipse 4 application using a project generation wizard. You will export this application as standalone application to finish a full development cycle early. After this first fast development cycle, you will create a larger Eclipse 4 application. This application will be extended and reworked to cover all relevant aspects of the Eclipse 4 platform. For example you will learn about the application model, SWT, JFace, OSGi services, Dependency Injection, Databinding, Internationalization, CSS styling and much more. Many thanks to Mike Milinkovich for providing a foreword. I would like to thank Remy Suen, Paul Webster, Brian de Alwis, Tom Schindl, Eric Moffat, Kai Tödter and Boris Bokowski from the e4 development team for their shared efforts and their support in answering my questions over the last years. I’m very much impressed by their friendliness and knowledge. A special thank you goes to Eric Moffat, Rabea Gransberger, Marcel Bruch and Boris Bokowski for a detailed review of the material. All remaining errors are my fault and I hope to have a few more reviewers of the book before the final release. This entry was posted in Eclipse, vogella. Bookmark the permalink. Awesome, I’ve been eagerly awaiting this. Just bought the book from Amazon DE and I’m happy to see it’s DRM-free so I can read it on my Linux box with Okular after dowloading it through the Kindle app. The (US) cloud reader at https://read.amazon.com/ also works if the book was purchased on Amazon DE btw. Sorry for my English school. Do you plan to publish your book in an open form (epub example)? I’m on Linux – Debian – Squeeze and I actually use FBReader for e-books. The solution Kindle close to me unsuitable. @Claude: Print version is planned, also iTunes (epub) after the official Eclipse 4 release. The book is not protected so you could use Calibre on Linux to read it. Yu say “The book is not protected so you could use Calibre on Linux to read it” but it is not possible to buy the book now if you do not have a Kindle reading application (Mac Windows only). I’m annoying, source code examples after the final version? @Claude, I wasn’t aware that there is no Kindle version for Linux. Some source code is already available at Github but not all examples. I use Git Branches for the sections. This is what we all need, to share our knowledge for free. Only god who can pay you as well. My son in colege must be need it. I just say thank’s. When are we going to have a .PDF version? I dont own a Kindle but i would like to buy the book and a want an electric version of it for my regular Android Tablet. @Mosnasq: A paper version should be available next week . I also plan to offer the book via Google Play in the next months or so.